We have had the pleasure of supporting an amazing charity run project that is making a positive impact on our local environment. ‘Wash Against Waste’ is the brain child of charitable trust EcoMatters, with the project being managed by Sarah Jane Murray. 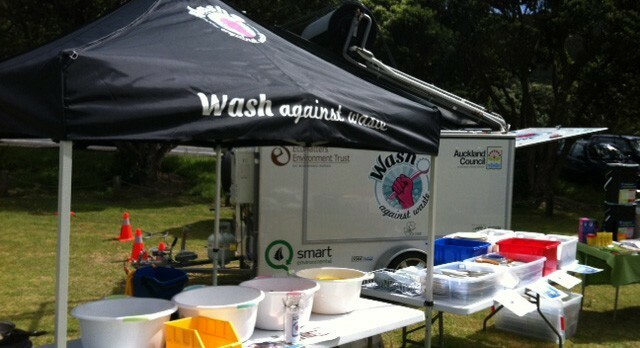 Sarah Jane, along with a team of volunteers is spending her Thursday evenings washing plates at the New Lynn Night Markets from a mobile trailer that is stocked with plates, cutlery, dishwash detergent and tea towels, in a fight against rubbish. In just 15 weeks ‘Wash Against Waste’ have reduced landfill waste by 54 bags of rubbish and more than 260 kilos of food. The goal is to eventually have several trailers available to be rented out for community events or festivals and Kemsol plans to be right there along-side them by sponsoring with product from the Kemsol Green range.